Sinn Féin Seanadóir Niall Ó Donnghaile raised the case of imprisoned Derry man, Tony Taylor, directly with Tánaiste Simon Coveney in the Seanad today and repeated his party’s call for his immediate release. The Seanadóir submitted the commencement matter after a meeting of the Joint Committee on the Implementation of the Good Friday Agreement which heard from Peter Bunting and Conal McFeely of the independent assessment team. 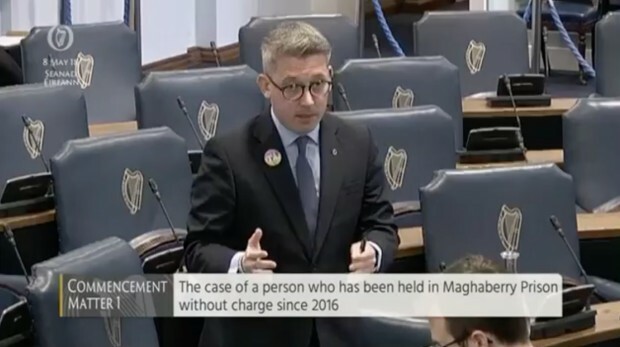 Speaking in the chamber, Seanadóir Ó Donnghaile said: “Given that over two years have passed since the arrest and subsequent imprisonment of Mr. Taylor, our view is that his continued detention is wrong and a violation of his human rights. “We have consistently stated that if there is evidence against Mr. Taylor, it should be presented to him and his legal team in open court,” he said. Tony Taylor has been detained in Maghaberry Prison since in March 2016 after his early release licence was revoked by then British Secretary of State Theresa Villiers. In June 2017, parole commissioners refused to release him from prison. Seanadóir Ó Donnghaile said that the British government has “failed to produce any evidence” that could justify Mr. Taylor's continued detention, whilst also placing significant stress and strain on his wife and family. “As you will know Tánaiste, the problem is that we are being asked to place our trust and our faith in faceless secret British intelligence agencies and services. The same people that have refused to release their files on the Dublin and Monaghan bombings and told us there were weapons of mass destruction in Iraq." He continued: "The concerns around this case, while predominately emanating from the nationalist and republican constituency, extend throughout a broad spectrum of humanitarian and legal organisations as well as the legal profession in general," he said.